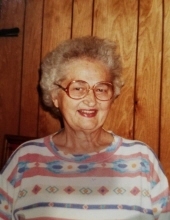 Helen F. Dowell age 91 of Bourbon, passed away on Thursday, November 1, 2018 in the Mason Healthcare Center in Warsaw. Helen was born on May 21, 1927 in South Bend, Indiana to Steve and Francis Banic, Sr. Helen has been a resident of the Bourbon area since the 1940’s. She was a graduate of Hanna High School in 1945. Then on July 13, 1946 Helen became the bride of Eugene Dowell, he preceded her in passing on October 5, 2006. Helen enjoyed being a homemaker and spending time with her family. She also retired from Coppes Kitchens in Nappanee. Helen was a member of the Bourbon American Legion Auxiliary Post 424 and a faithful member of the Bourbon 1st United Methodist Church. Those left to cherish Helen’s memory are her daughter, Sharon Smith of Warsaw, her son, Terry (Rainelle) Dowell of Mentone; four grandchildren, Dawn (Needler) husband Robert Derbyshire of Warsaw, Greg Needler of Ft. Wayne, Indiana, John and Melissa Dowell of Plymouth, Indiana and Kim and Chad Vermillion of Plymouth, Indiana; several great and great-great grandchildren; sisters, Barb Shearer of Bourbon, Pasty Patterson of Mishawaka, Joan Fry of Oklahoma, Polly (Dave) Pruitt of Anderson and Roseanne of Oklahoma, brothers, Steve Banic of Bourbon, David (Diane) Banic of Bourbon and Bobby (Lavonda) Banic of Bourbon. Helen is preceded in passing by her parents, daughter, Debbie, and her two brothers, Mike and Martin Banic. The Deaton-Clemens Funeral Home is honored to be entrusted with the arrangements for the Dowell family. A graveside service will be held on Monday, November 5, 2018 at the Pleasant Hill Cemetery at 11:00 a.m. with Pastor Denny Bollenbacher officiating. The Dowell family requests memorial contribution be made to Heart to Heart Hospice, 7221 Engle Road Suite 100 Ft. Wayne, Indiana 46804 or Kosciusko County Welfar League. To send flowers or a remembrance gift to the family of Helen F. Dowell, please visit our Tribute Store. "Email Address" would like to share the life celebration of Helen F. Dowell. Click on the "link" to go to share a favorite memory or leave a condolence message for the family.